Designed by naval architect Phil Southwell. 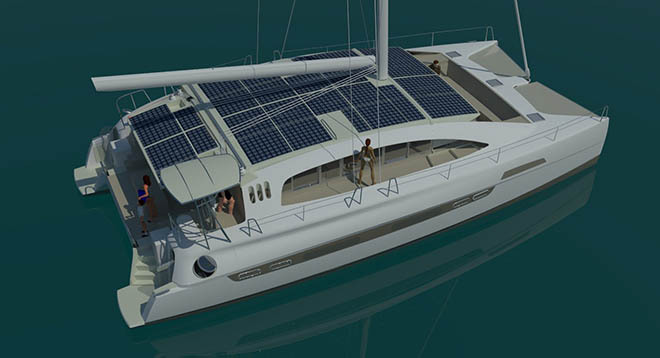 The all new VOYAGE E570 features a hybrid electric system from Oceanvolt with 8kW of solar panels, 32 kWh of light weight high capacity Lithium ion battery banks, as well as powerful, regenerating motors. The Oceanvolt 15kW electric motors are powered by a 48V bank of high capacity Lithium ion batteries. The batteries are also used to power the air conditioning system, navigation systems, refrigeration, and all other electric appliances. The battery banks are charged by the solar panels, as well as the regenerating electric drives when the vessel is under sail. While sailing at 8-12 knots, the engines will be charging the batteries at a rate of 2-3 kW. Twin 14kW DC generators provide the ability to quickly recharge the battery banks and can also provide power directly to the electric drives for long distance motoring. This system can be further complemented by a remote service interface, enabling live diagnostics and management of the yacht's electric system, as well as the status and charge rate of the batteries. This interface also offers integration with the yacht's navigation providing the ability to remotely track the vessel's position and course.